Scuba diving is popular in regions of the world with incredible underwater environments. The Caribbean, for example, has a thriving scuba diving community, as does Australia and the rest of the tropical and subtropical Pacific. You can often rent scuba equipment if you only plan on a few excursions beneath the waves, but if you're going to make it a hobby, then you'll want to buy your own equipment. Scuba is the common term used for the acronym "Self Contained Underwater Breathing Apparatus." 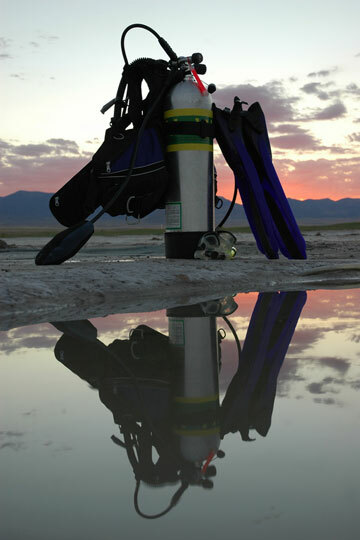 Basic gear for scuba is the mouthpiece or mask, the tanks, and the regulator. The regulator controls the flow of air into the mouthpiece. Rebreathers are a slightly different form of scuba gear. Rebreathers reprocess exhaled air to make it breathable again. There are several secondary pieces of equipment related to scuba diving. The wetsuit, for example, is important for maintaining body temperature at greater depths. Depth gauges are also important to help prevent pressure sickness. Scuba isn't just a sport or recreational activity. Many people have turned their scuba diving abilities into a profession. For example, skill in scuba diving is important for underwater construction projects and safety. Law enforcement also has training available for scuba diving to assist in water rescues and searches. Southern California-based scuba superstore offers scuba equipment sales and repairs, scuba diving instruction, and a wealth of scuba information resources. This Florida-based store features an extensive selection of dive gear, snorkel equipment, scuba accessories, and underwater cameras. Since introducing the world to scuba diving more than 60 years ago, Aqua Lung has become the leading name in aquatic equipment. Some of the many products offered by this company include regulators, buoyancy compensators, masks, fins, snorkels, and wetsuits. Designs and manufactures scuba equipment and dry suits for recreational, public safety, military, and commercial diving.